Pickleball is a fun and funny racket and net game that is said to be a kind of a mashup between tennis, badminton, and ping pong. The game was created just over 50 years ago by a couple of parents whose children were too small to play tennis. So they created a game with a shorter net, played on a smaller court with large but light rackets and a whiffle-ball instead of a heavier tennis ball. The game got its name from the family dog named Pickles, who would continuously steal the game-ball, hence- Pickleball. It all got started about half a century ago in the 1960s on Bainbridge Island by Marty MacCallum and his wife. They were having a hard time getting their children to spend time outside away from the television and decided to do something about it. So they invented Pickleball. Since then, the game has grown in popularity with leagues springing up in YMCAs and recreation clubs all across the country. It is notably most popular with young children and senior citizens since the equipment is easy to use and the court is fairly small. There is a bit of controversy over how the game got its name. Some people insist that it was named after the MacCallum family dog Pickles, while other say it comes from competitive rowing. In competitive rowing, when the boat is filled with a mixture of rowers of different sizes and ability, that boat is called a “pickle” because it looks ‘bumpy,’ unlike a regulation crew. Pickleball is a fun, fast, and friendly game which is largely similar to the other court and net games that inspired it- but the one unique rule to Pickleball is that everyone on the court must have fun. The ball is served underhand because it’s a friendly game. The rules of the game specify that the server must keep the paddle below the wrist and below the waist when serving the ball. This sets the tone for a volley and helps keep everything fun and friendly. A round of Pickleball begins after one team serves the ball. The ball must then bounce on that side of the court, be returned, bounce on the opposite side of the court, and then the volley begins with players bouncing the ball back and forth directly over the net with no bouncing. The Pickleball court is similar to that of most similar games, with a couple of unique features that you’ll only see in Pickleball. 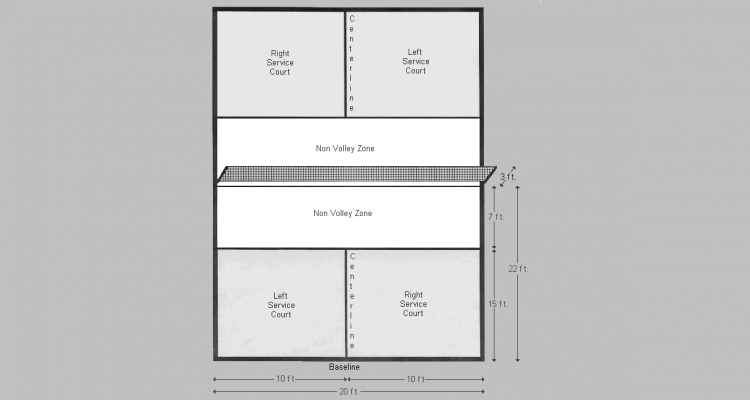 First is the “No Volley Zone,” or “The Kitchen.” This is a rectangle covering the width of the court and extending seven feet from the net on both sides of the net. Players are not allowed to enter this area or bounce the ball in it. Pickleball players say, “Don’t go in the kitchen.” The one exception to this rule is if a ball has fallen weakly, (called a dink ball), into the kitchen and is about to go out of play, a player may go into the Kitchen to tap it gently back into play. This is a good example of how the rules are more geared toward keeping the fun going than they are toward competitive play. The court is about one-quarter the size of a regulation Tennis Court at 20ft in width, and 44ft in length. Like a tennis court, the Pickleball court is divided in half lengthwise. The entire “Kitchen” is 14ft by 20ft when you include both sides of the net. So, with the “Kitchen” rule, and the buildup volley style of the game, it is clear that the game is meant to keep the action friendly, light, and persistent. The rules are designed to give everyone time to get ready for the excitement of a long lasting volley. The game is notably devoid of the “finishing moves” that you see in tennis and volleyball, where players can charge up to the net and suddenly spike the ball, ending the play. In Pickleball, this is seen as anti-fun, since it stops the play. Anyone who has ever played Ping Pong, Volleyball or Tennis knows it’s most fun when the volley goes on for a long time. 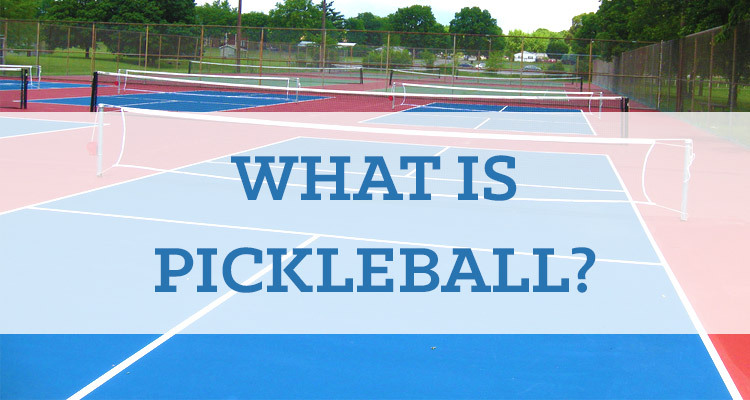 The whole idea of Pickleball is to maximize the life of the volley so that the most exciting part of the game goes on for a longer amount of time. The result is a game that is very popular with people of all ages. The necessary equipment includes a wiffleball, a paddle, a regulation net, and court. The paddle is similar to a ping pong paddle, but it is a little bit bigger and heavier and does not have the rubber texture on the paddle. Players generally wear light and loose clothing such as shorts and a t-shirt, and team uniforms generally follow this norm.